Instructions: Cut a piece of white cardstock to 10 x 7" size, score and fold at 5" to create card base. Cut a piece of dark fuchsia paper from the Tulip Time paper collection to 6 7/8 x 4 3/8" size and attach onto card base. Use from HCD1-7229 Diamonds & Lace Die to diecut the decorative diamond panel from white cardstock. Cut decorative diamond in half and layer onto card, leaving 5/8" gap in between top and bottom to elongate. Use from the HCD1-7227 Eyelet Diamond Die to diecut the largest diamond from white cardstock. Sponge edges with Magenta Hue ink and use dimensional adhesive to attach onto card. Use from the HCD1-7226 Diamond Basics Die to diecut the largest diamond from white cardstock. Stamp the sentiment from HCPC-3844 For My Friend Sentiments Cling Stamp Set in Vibrant Fuchsia ink onto the diamond, and then use dimensional adhesive to attach onto card as pictured. Stamp the large and medium blossoms from HCPC-3842 Oakberry Lane Blossoms Cling Stamp Set in Magenta Hue ink onto white cardstock and diecut with coordinating dies. Stamp the medium and small blossoms from same stamp set in Tiger Lily ink onto white cardstock and diecut with coordinating dies. Stamp the small blossoms from same stamp set in Cactus Flower ink onto white cardstock and diecut with coordinating dies. Stamp leaves 2x from the same stamp set in Vivid Chartreuse ink onto white cardstock and diecut with coordinating dies. Use the Stack and Store daubers to color the images. For 2 of the large and 1 medium pink blossoms, use Magenta Hue ink on the edges of petals and Vivid Chartreuse in the centers. For 4 medium and 2 small peach-colored blossoms, use Tiger Lily on the edges of petals and Vivid Chartreuse in the centers. For 4 small purple blossoms, use Cactus Flower ink on the edges of petals and Vivid Chartreuse in the centers. For the leaves use a light touch of Vivid Chartreuse ink. 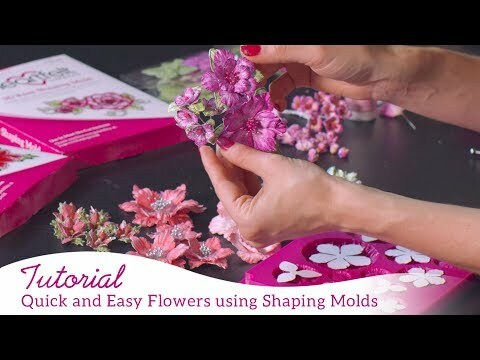 Place the blossoms and leaves into the HCFB1-469 3D Blossoms Shaping Mold, lightly mist with water and send through die cutting machine. Then assemble the blossoms together as pictured. Pierce a hole through the blossom centers and thread the green and yellow wire stamens through the peach-colored blossoms. Use the burgundy stamens for the rest of blossoms. Use hot glue to attach wire on the backside of each flower. Trim wire to desired length and then use hot glue to attach onto card. Use hot glue again to attach leaves, trimming them apart as desired. 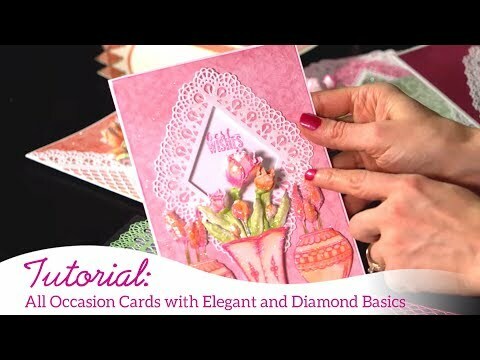 Use the Dries Clear glue along with Crystal glitter to add a touch of sparkle over card as desired.